New episodes of 'Pushing Daisies' will be broadcast next Tuesday. The strike-shortened season last Spring caused this program to have its remaining new eps shelved to..well, now. Sure, the premise of this show is cute...very Tim Burton, but after a few viewings, it's all a bit one-note, isn't it? You've seen one episode, you've seen 'em all. Final verdict: Don't count on this series being alive for long. Very one note. I watched two shows and was bord midway through episode two. 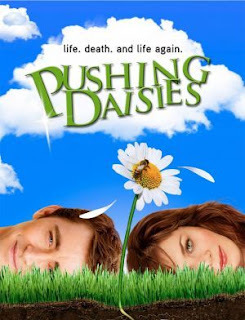 I love Pushing Daisies. It is beautiful to look at, the characters are really terrific and it keeps me smiling every week. It certainly has its own groove that you have to get with. If you have never seen if, go check out http://abc.go.com/primetime/pushingdaisies/index?pn=index.